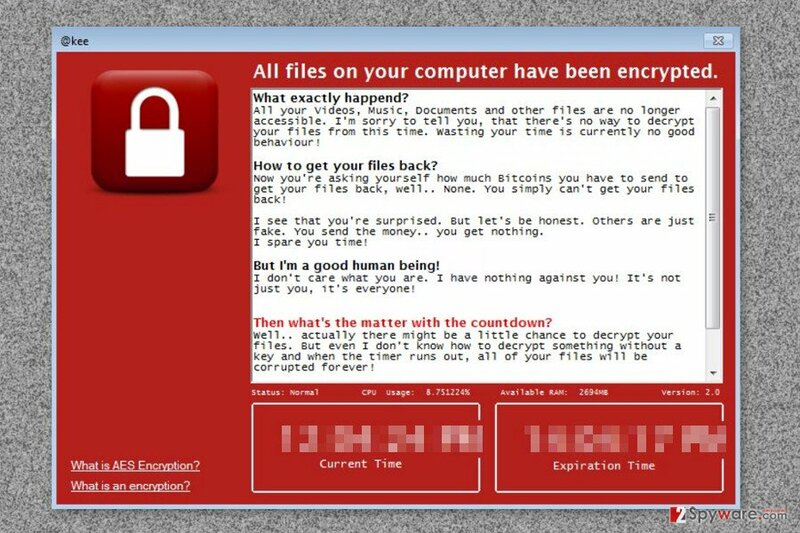 Kee ransomware uses sophisticated techniques to infiltrate computers and hide from its victims. Use Reimage to determine whether your system is infected and prevent the loss of your files. Kee ransomware is a new file-encrypting virus that uses AES cryptography to encrypt files on the affected computer. Malware aims at video, audio, video, text and other widely used file types. Following data encryption, it drops a ransom-demanding message in “Hello There! Fellow @kee User!.txt” file and runs a program window that states “All files on your computer have been encrypted. The author of Kee doesn’t seem interested in a traditional swap – victim’s Bitcoins for decryption software. In the ransom message, it is stated that people cannot get back their files. Moreover, once the timer provided in the pop-up window comes to zero, all encrypted files will be deleted. Hacker tries to be honest and tells that there might be a chance to decrypt data; however, he or she doesn’t know how to do it. Thus, there’s not much you can do after the attack. Just remove Kee from the device and look up for data recovery solution! It seems that developer of the ransomware is disappointed in whole ransomware business. In the message, hacker talks about other cyber criminals asking for Bitcoins and never providing a decryption software. Thus, this piece of malware is just a destructive program that does not even profit its owner. Maybe, the creator of Kee virus became a victim of crypto-malware and lost his or her money. As a result, the hacker decided to spread the anger and cause damage to other computer users. We believe that creating ransomware virus in order to teach people about risks with paying the ransom is not a nice motive. However, if you ever encounter this uncommon file-encrypting virus, all you have to do is to get rid of it. 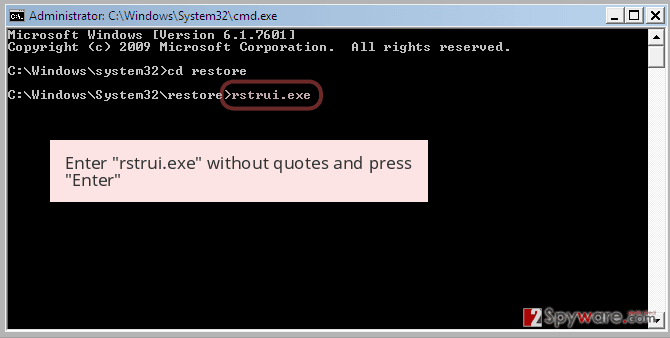 Kee removal is performed using malware removal program, such as Reimage. 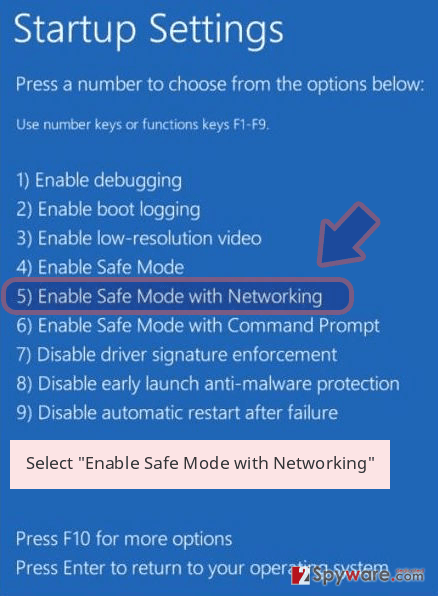 If you cannot install or access security tool, please scroll down to the end of the article. There you will find detailed instructions how to deal with these obstacles. What is more, data recovery solutions are also presented down below. Developer of Kee has no idea how to decrypt files and threatens to delete them. Kee might be spreading using complex techniques. The most popular of them is undoubtedly malicious email attachments. Malicious payload might be attached to a regular email and look like as innocent Word or PDF document. Usually, such letters inform about a necessity to open the invoice, flight tickets or check other important information provided in the attachment. However, once a person clicks on obfuscated file, the malicious payload is dropped and executed on the system. Kee hijack might also occur after clicking on a malware-laden advertisement. Malicious ads might be placed not only on high-risk websites but also on your favorite news portal. Bear in mind malvertising is growing rapidly and infected ads might barely differ from legitimate ones. Lastly, you can encounter Kee when downloading software and updates from unknown online sources. Besides, you should not forget to update all programs installed on the device. Ransomware can also use exploit kits and take advantage of outdated programs to infiltrate the computer. If you see a worrying window on the screen that informs about deleting your files in a couple of hours, you should not waste your time. 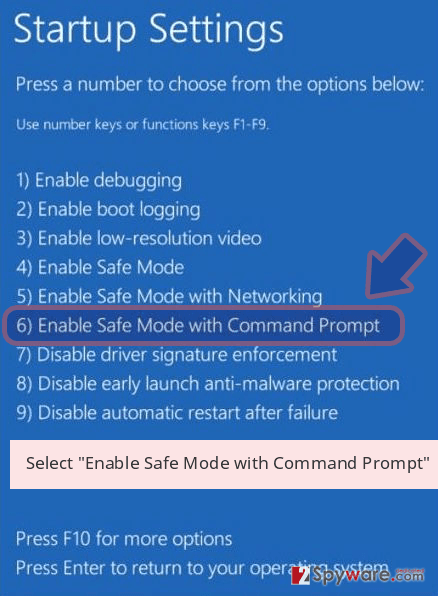 Install reputable malware removal program and remove Kee from the device. It helps to protect your files from the deletion if ransomware is actually capable of doing that. We recommend performing automatic virus removal using Reimage, Plumbytes Anti-MalwareMalwarebytes Malwarebytes or Malwarebytes MalwarebytesCombo Cleaner. These programs are capable of locating and deleting all malicious files and processes running on the system. However, you should not forget to update your chosen malware removal tool first! Sadly, Kee removal won’t help to recover your files. For that, you will need to use backups or try alternative ways to restore your data. 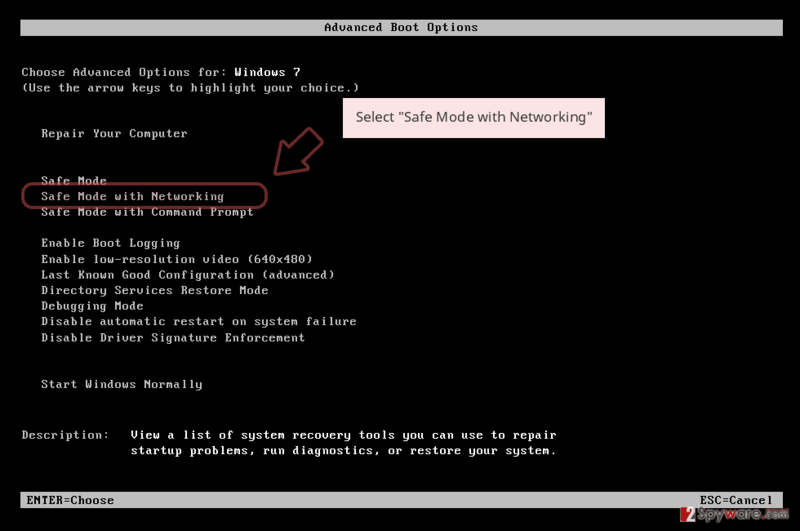 Restart your computer to the Safe Mode with Networking in order to delete virus automatically. Log in to your infected account and start the browser. Download Reimage or other legitimate anti-spyware program. Update it before a full system scan and remove malicious files that belong to your ransomware and complete Kee removal. 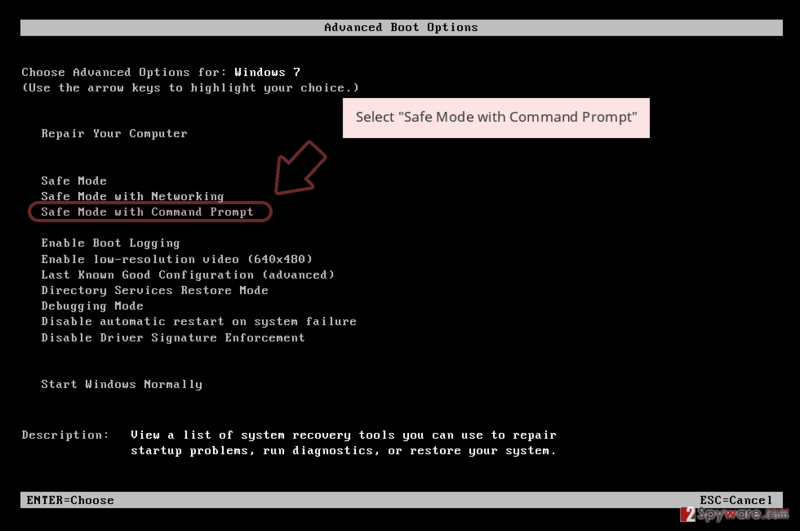 Follow the steps below to reboot the computer to the System Restore mode. It helps to disable the virus and remove it with the help of security software. 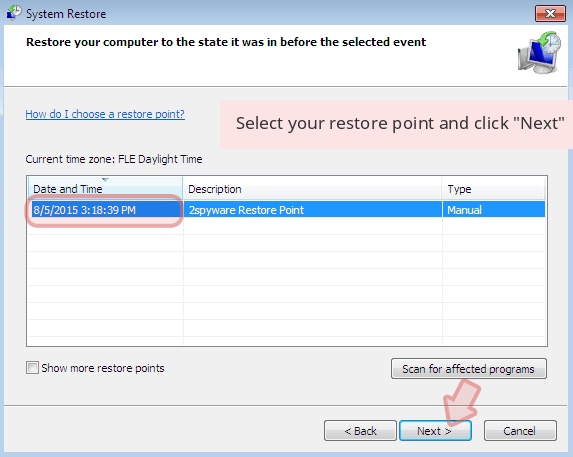 When a new window shows up, click Next and select your restore point that is prior the infiltration of Kee. After doing that, click Next. Once you restore your system to a previous date, download and scan your computer with Reimage and make sure that Kee removal is performed successfully. Guide which is presented above is supposed to help you remove Kee from your computer. To recover your encrypted files, we recommend using a detailed guide prepared by 2-spyware.com security experts. If you do not have data backups, there’s not much what you can do. Chances to restore your files are low. However, you should not give up. Our team is willing to help you and offers to try these three alternative recovery methods. Data Recovery Pro is a professional software that helps to restore corrupted, deleted and some of the encrypted files. It’s the only possible option to recover files automatically. 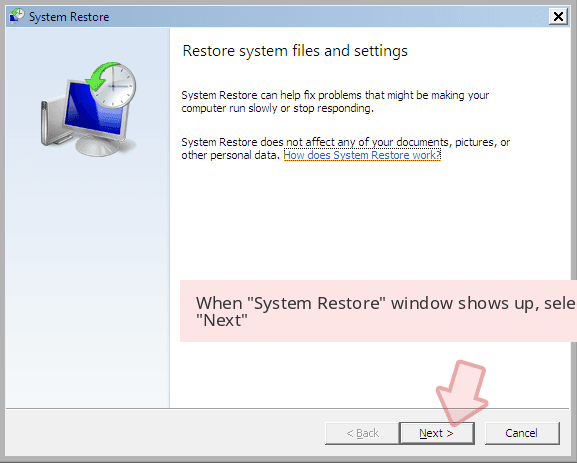 If System Restore method has been activated before Kee ransomware attack, you can travel back in computer’s time and access previously saved versions of the files. It’s unknown whether malware can delete Shadow Volume Copies of the targeted files or not. If such copies are left, you could use ShadowExplorer and restore your files. ^ Margaret Rouse. Advanced Encryption Standard (AES). TechTarget. Includes tips, webcasts, and other advice in a variety of focused enterprise technology channels. ^ David Swan. Malicious emails at five-year high. The Australian. Latest Australian National and Live Business News. This entry was posted on 2017-05-16 at 07:30 and is filed under Ransomware, Viruses. You can quickly scan the QR code with your mobile device and have Kee ransomware virus manual removal instructions right in your pocket. How did you remove Kee virus?